Leading Manufacturer of positive displacement pump from Nashik. Over the years, we have gained immense credibility across different domestic markets in offering a wide assortment of Positive Displacement Pump. In each cycle of operation, these pumps displace a particular amount of fluid. Easily Compatible with most of the fluids. High Flow rates of 0-4000 liters/hr High Pressure of 98 kg/sq. 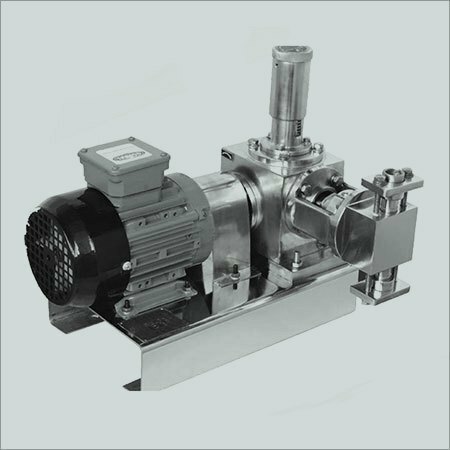 - 275 kg/cm2Simplex and Multiplex arrangements of pumps with common drive available for universal use Flow Rate is linear to stroke length variations. Flow Metering Accuracy is almost independent of back pressure of liquid Discharge flow rate is linear to aeration of stroke length It can achieve flow rates up to 4000 lts/hr and delivery pressures up to 275 kg/sq.cm. Steady state metering accuracy of +/-3% of pump output Plunger is in ss 316 and hard chrome plated.